Another CD from Japan's Dub Store Records in Tokyo. 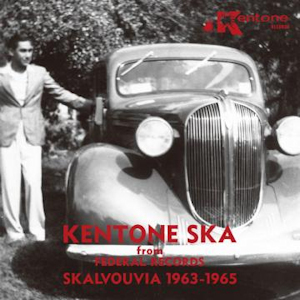 Recordings from founder of Jamaica’s first recording studio, Ken Khouri produced some great early ska classics. It includes a brilliant Ska instrumental by guitarist Ernest Ranglin, 'Free Form' a driving record with outstanding trumpet and saxophone solos, with great guitar fills. The 45 was originally issued on Kentone records backed on the B side by 'Skalvouvia'. The chances of finding an original copy of this 45 are extremely remote. Other outstanding tracks are Eric Monty Morris and 'Blackman Ska', Toots & The Maytals 'One Look', Eddie Perkins 'I Am Blue'. Great cover photograph of Ken Khouri and his prized car! Highly recommended CD. Issued on Dud Store DSR CD 024 Japan.